1. What is Html.DropDownList and Html.DropDownListFor Methods? 2. What is the difference between Html.DropDownList and Html.DropDownListFor method? DropDownList is a visual control with down arrow which displays a list of items and forces you to choose only one item at a time. DropDownList is not editable, it means the user cannot enter own value and limited to choose an item from the selection. Html.Helper class provides two extension method for working with DropDownList. Html.DropDownList is a loosely type that means it is not strongly bound to any list items and model properties. c. string optionLabel is the optional informative string like please choose item, select item, select value etc. d. object HtmlAttributes adds extra features to dropdownlist. 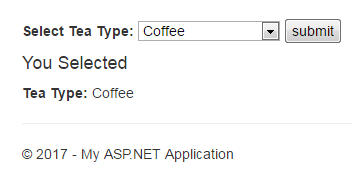 You have noticed that 2 extra attributes are added in the html output: data-val and data-val-required. Data-val ="true" and data-val-required="The SelectTeaType field is required." 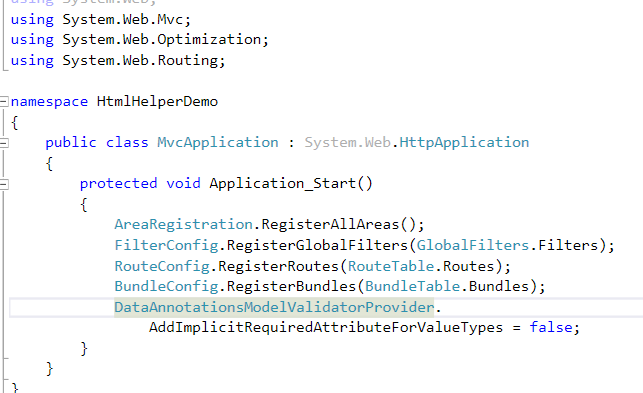 are coming because By default MVC adds [Required] attribute to non-nullable value types. To fix it, add the following line into Application_Start method in Global.asax file. a. model => model.property: It binds DropDownListFor with specific model property. b. IEnumerable<SelectLestItem> selectList: It is the list of items. In this chapter, you learned basic Html.DropDownList operation with complete programming example. Here I am adding some more programming examples on DropDownList, you must check and learn them for better understanding. In the next chapter, you will learn Html.ListBox.